Journal of the House of Lords Volume 26, 1741-1746. Originally published by His Majesty's Stationery Office, London, 1767-1830. Le Neve against Norris & al. The Answer of John Norris, an Infant, by John Carthew his next Friend, and others, to the Appeal of Isabella Le Neve Spinster and others, was brought in. Hodie 3a vice lecta est Billa, intituled, "An Act for empowering John Thornhagh Esquire to make a Jointure and Provisions for his Younger Children, out of an Estate comprized in a voluntary Settlement made by Saint Andrew Thornhagh Esquire, his late Father, deceased." Hodie 2a vice lecta est Billa, intituled, "An Act for vesting divers Lands and Hereditaments, devised by the Will of Richard Cliffe Esquire, deceased, in Trustees, to be sold, for paying the Debts and Legacies charged thereupon by the said Will; and for laying out the Surplus of the Money arising by such Sale (if any) in purchasing other Lands, to be settled to the Uses of the said Will." Viscount Townshend. L. Bp. Rochester. L. Bp. Bangor. L. Carteret, Sec. Their Lordships, or any Five of them; to meet on Thursday the 5th Day of April next, at the usual Time and Place; and to adjourn as they please. The Duke of Portland reported from the Lords Committees to whom the Bill, intituled, "An Act for continuing and enlarging the Term and Powers granted by an Act of Parliament, passed in the Thirteenth Year of the Reign of His late Majesty King George the First, for repairing the Road from Cranford Bridge, in the County of Middlesex, to that End of Maidenhead Bridge which lies in the County of Bucks," was committed: "That they had considered the said Bill, and examined the Allegations thereof, which were found to be true, and that the Committee had gone through the Bill, and directed him to repo the same to the House, without any Amendment." His Grace made the like Report from the Lords Com mittees to whom the Bill, intituled, "An Act for naturalizing Bernhard Joachim Boetefeur," was committed. 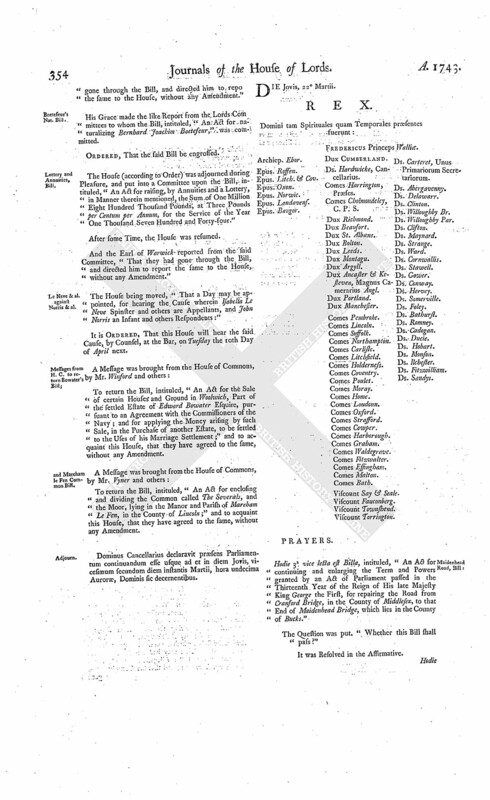 The House (according to Order) was adjourned during Pleasure, and put into a Committee upon the Bill, intituled, "An Act for raising, by Annuities and a Lottery, in Manner therein mentioned, the Sum of One Million Eight Hundred Thousand Pounds, at Three Pounds per Centum per Annum, for the Service of the Year One Thousand Seven Hundred and Forty-four." Le Neve & al. against Norris & al. The House being moved, "That a Day may be appointed, for hearing the Cause wherein Isabella Le Neve Spinster and others are Appellants, and John Norris an Infant and others Respondents:"
It is Ordered, That this House will hear the said Cause, by Counsel, at the Bar, on Tuesday the 10th Day of April next. To return the Bill, intituled, "An Act for the Sale of certain Houses and Ground in Woolwich, Part of the settled Estate of Edward Bowater Esquire, pursuant to an Agreement with the Commissioners of the Navy; and for applying the Money arising by such Sale, in the Purchase of another Estate, to be settled to the Uses of his Marriage Settlement;" and to acquaint this House, that they have agreed to the same, without any Amendment. and Mareham le Fen Common Bill. To return the Bill, intituled, "An Act for enclosing and dividing the Common called The Severals, and the Moor, lying in the Manor and Parish of Mareham Le Fen, in the County of Lincoln;" and to acquaint this House, that they have agreed to the same, without any Amendment. Dominus Cancellarius declaravit præsens Parliamentum continuandum esse usque ad et in diem Jovis, vicesimum secundum diem instantis Martii, hora undecima Auroræ, Dominis sic decernentibus. Comes Cholmondeley, C. P. S.
Viscount Torrington. Ds. Carteret, Unus Primariorum Secretariorum. Hodie 3a vice lecta est Billa, intituled, "An Act for continuing and enlarging the Term and Powers granted by an Act of Parliament passed in the Thirteenth Year of the Reign of His late Majesty King George the First, for repairing the Road from Cranford Bridge, in the County of Middlesex, to that End of Maidenhead Bridge, which lies in the County of Bucks." Hodie 3a vice lecta est Billa, intituled, "An Act for raising, by Annuities and a Lottery, in Manner therein mentioned, the Sum of One Million Eight Hundred Thousand Pounds, at Three Pounds per Centum per Annum, for the Service of the Year One Thousand Seven Hundred and Forty-four." Messages to H. C. that the Lords have agreed to the preceding Bills. The Lord Ilchester reported from the Lords Committees to whom the Bill, intituled, "An Act for vesting the Estate late of George Downes Esquire, deceased, in the County of Wilts, in Edward Gale Gentleman and his Heirs, in Trust, to convey the same to Robert Neale Esquire and his Heirs (pursuant to Articles of Agreement made for Sale thereof), towards Payment of the Encumbrances charged thereupon; and for other Purposes therein mentioned," was committed: "That they had considered the said Bill, and examined the Allegations thereof, which were found to be true; that the Parties concerned had given their Consents; and that the Committee had gone through the Bill, and made One Amendment thereunto." Ordered, That the said Bill, with the Amendment, be engrossed. To return the Bill, intituled, "An Act for settling a Capital Messuage, Lands, and Hereditaments, in East Grinstead, in the County of Sussex, to divers Uses therein mentioned, for the Benefit of William Lord Abergavenny and his Family, as an Equivalent for a Sum of Money appointed by a former Act to be laid out in the Purchase of Lands for that Purpose;" and to acquaint this House, that they have agreed to the same, without any Amendment. and Hervey to take the Name of Aston, Bill. To return the Bill, intituled, "An Act for confirming to the Honourable Henry Hervey Clerk, his Wife, and their Issue, the Surname and Arms of Aston, pursuant to a Settlement made by Sir Thomas Aston Baronet, deceased;" and to acquaint this House, that they have agreed to the same, without any Amendment. His Majesty, being seated on the Throne, with the accustomed Ceremonies; the Prince of Wales and the Duke of Cumberland (in their Robes) sitting in their respective Places; the Lords being also in their Robes; commanded the Gentleman Usher of the Black Rod to let the Commons know, "It is His Majesty's Pleasure, that they attend Him immediately, in this House." Who being come, with their Speaker. He, after a short Introduction in relation to the Money Bills, delivered the same to the Clerk, who brought them to the Table; where the Clerk of the Crown read the Titles of those and the other Bills ready for the Royal Assent, as follow. "1. 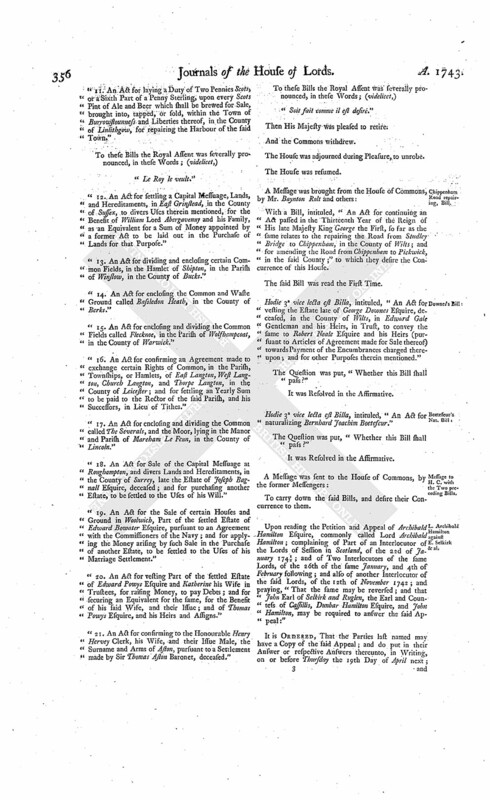 An Act for granting to His Majesty the Surplus or Remainder of the Monies arisen, or to arise, by the Duties on Spirituous Liquors, granted by an Act of the last Session of Parliament; and for explaining and amending the said Act, in relation to the Retailers of such Liquors; and for establishing an Agreement with the United Company of Merchants of England trading to The East Indies." "2. An Act for raising, by Annuities and a Lottery, in Manner therein mentioned, the Sum of One Million Eight Hundred Thousand Pounds, at Three Pounds per Centum per Annum, for the Service of the Year One Thousand Seven Hundred and Forty-four." "3. An Act for the speedy and effectual recruiting of His Majesty's Land Forces and Marines, for the Year One Thousand Seven Hundred and Forty-four." "4. An Act for punishing Mutiny and Desertion; and for the better Payment of the Army and their Quarters." "5. An Act for more effectually repairing the Road from Cherill (through Calne) to Studley Bridge, and from Cherill to The Three Mile Borough, at the Top of Cherill Hill, in the County of Wilts." "6. An Act for continuing and making more effectual an Act made in the Eleventh Year of His present Majesty's Reign, for repairing several Roads, leading to and from the Town of Derby, in the County of Derby." "7. An Act for more effectually repairing the Roads from Coleshill, in the County of Warwick, through the City of Litchfield, to Stone, in the County of Stafford, and from thence to the City of Chester; and for amending other Roads therein mentioned." "8. An Act for repairing the Road leading from the End of Middleton Tyas Lane, over Gatherly Moor, to Greetabridge, and from thence to Bowes, in the North Riding of the County of York." "9. An Act for repairing the Road between the Town of Kingston upon Hull, and the Town of Beverley, in the East Riding of the County of York." "10. 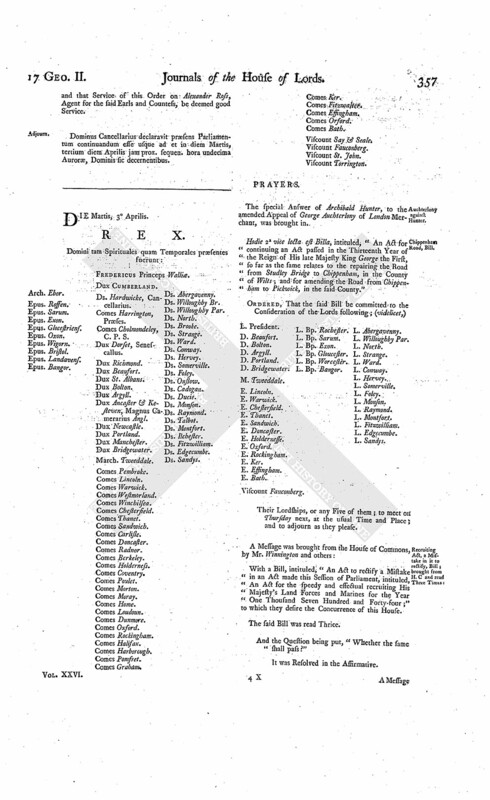 An Act for continuing and enlarging the Term and Powers granted by an Act of Parliament passed in the Thirteenth Year of the Reign of His late Majesty King George the First, for repairing the Road from Cranford Bridge, in the County of Middlesex, to that End of Maidenhead Bridge which lies in the County of Bucks." "11. An Act for laying a Duty of Two Pennies Scots, or a Sixth Part of a Penny Sterling, upon every Scots Pint of Ale and Beer which shall be brewed for Sale, brought into, tapped, or sold, within the Town of Burrowstouness and Liberties thereof, in the County of Linlithgow, for repairing the Harbour of the said Town." "12. An Act for settling a Capital Messuage, Lands, and Hereditaments, in East Grinstead, in the County of Sussex, to divers Uses therein mentioned, for the Benefit of William Lord Abergavenny and his Family, as an Equivalent for a Sum of Money appointed by a former Act to be laid out in the Purchase of Lands for that Purpose." "13. An Act for dividing and enclosing certain Common Fields, in the Hamlet of Shipton, in the Parish of Winslow, in the County of Bucks." "14. An Act for enclosing the Common and Waste Ground called Bassledon Heath, in the County of Berks." "15. An Act for enclosing and dividing the Common Fields called Flecknoe, in the Parish of Wolfhampcoat, in the County of Warwick." "16. An Act for confirming an Agreement made to exchange certain Rights of Common, in the Parish, Townships, or Hamlets, of East Langton, West Langton, Church Langton, and Thorpe Langton, in the County of Leicester, and for settling an Yearly Sum to be paid to the Rector of the said Parish, and his Successors, in Lieu of Tithes." "17. An Act for enclosing and dividing the Common called The Severals, and the Moor, lying in the Manor and Parish of Mareham Le Fenn, in the County of Lincoln." "18. An Act for Sale of the Capital Messuage at Roughampton, and divers Lands and Hereditaments, in the County of Surrey, late the Estate of Joseph Bagnall Esquire, deceased; and for purchasing another Estate, to be settled to the Uses of his Will." "19. 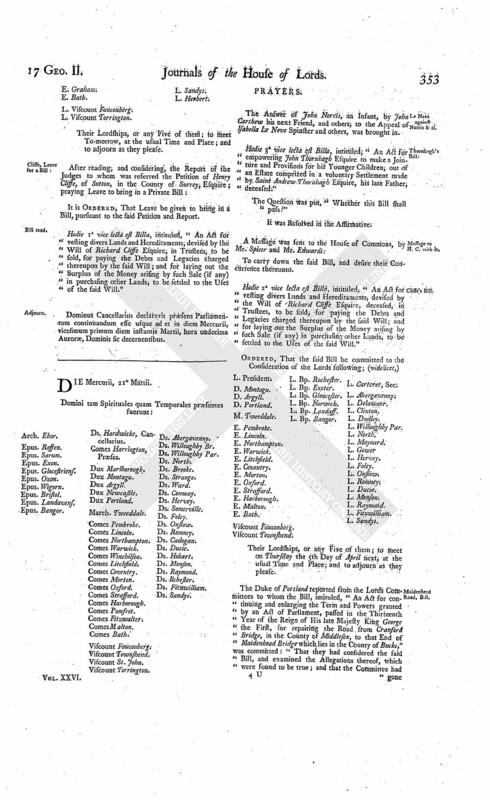 An Act for the Sale of certain Houses and Ground in Woolwich, Part of the settled Estate of Edward Bowater Esquire, pursuant to an Agreement with the Commissioners of the Navy; and for applying the Money arising by such Sale in the Purchase of another Estate, to be settled to the Uses of his Marriage Settlement." "20. An Act for vesting Part of the settled Estate of Edward Powys Esquire and Katherine his Wife in Trustees, for raising Money, to pay Debts; and for securing an Equivalent for the same, for the Benefit of his said Wife, and their Issue; and of Thomas Powys Esquire, and his Heirs and Assigns." "21. An Act for confirming to the Honourable Henry Hervey Clerk, his Wife, and their Issue Male, the Surname and Arms of Aston, pursuant to a Settlement made by Sir Thomas Aston Baronet, deceased." 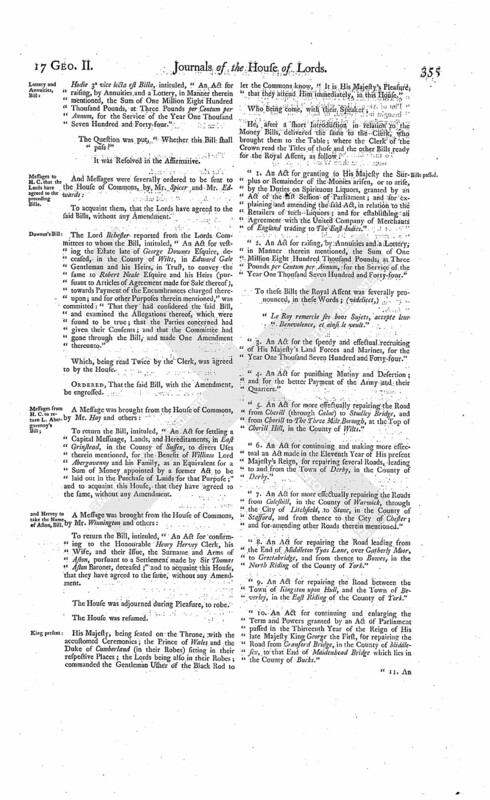 With a Bill, intituled, "An Act for continuing an Act passed in the Thirteenth Year of the Reign of His late Majesty King George the First, so far as the same relates to the repairing the Road from Studley Bridge to Chippenham, in the County of Wilts; and for amending the Road from Chippenham to Pickwick, in the said County;" to which they desire the Concurrence of this House. Hodie 3a vice lecta est Billa, intituled, "An Act for vesting the Estate late of George Downes Esquire, deceased, in the County of Wilts, in Edward Gale Gentleman and his Heirs, in Trust, to convey the same to Robert Neale Esquire and his Heirs (pursuant to Articles of Agreement made for Sale thereof) towards Payment of the Encumbrances charged thereupon, and for other Purposes therein mentioned." Hodie 3a vice lecta est Billa, intituled, "An Act for naturalizing Bernhard Joachim Boetefeur." L. Archibald Hamilton against E. Selkirk & al. Upon reading the Petition and Appeal of Archibald Hamilton Esquire, commonly called Lord Archibald Hamilton; complaining of Part of an Interlocutor of the Lords of Session in Scotland, of the 22d of January 1741/2; and of Two Interlocutors of the same Lords, of the 26th of the same January, and 4th of February following; and also of another Interlocutor of the said Lords, of the 12th of November 1742; and praying, "That the same may be reversed; and that John Earl of Selkirk and Ruglen, the Earl and Countess of Cassillis, Dunbar Hamilton Esquire, and John Hamilton, may be required to answer the said Appeal:"
It is Ordered, That the Parties last named may have a Copy of the said Appeal; and do put in their Answer or respective Answers thereunto, in Writing, on or before Thursday the 19th Day of April next; and that Service of this Order on Alexander Ross, Agent for the said Earls and Countess, be deemed good Service. Dominus Cancellarius declaravit præsens Parliamentum continuandum esse usque ad et in diem Martis, tertium diem Aprilis jam prox. sequen. hora undecima Auroræ, Dominis sic decernentibus.